Like many fans of the Dragon Ball franchise, I have been at war with myself for many, many years in regards to my feelings towards the character Broly. He was a creature of raw power who was a formidable adversary to our heroes time and again in several of the movies. Yet despite the pure overflowing aura of “coolness” the character gave off, Broly also shoulders the burden of having one of the absolutely dumbest character motivations in all of fiction. In his original incarnation Broly was a house of brutal rage and scorn...because the hero of the series, Goku, cried a lot when the two were babies on their alien homeworld of Planet Vegeta. It was this stark contrast of what many consider awesome and lame being combined into the same being that has caused such a fierce division when it comes to discussions about Broly. There was absolutely no middle ground it would appear. Either you flat out unquestionably loved Broly because of how badass he was presented as being, or you hated him because they wasted his potential with such weak character writing. When news broke that they would be doing a new Broly movie, this time officially within the confines of the Dragon Ball Super canon and with Akira Toriyama finally directly handling the character, people were ecstatic at the possibilities. Even many of Broly’s staunchest detractors were interested to see if Toriyama, the father of Dragon Ball himself, could rehabilitate the much maligned broccoli boy. Needless to say Toriyama not only met the challenge head on, he easily blew past it to help create not only what is far and away Broly’s best outing as a character, but quite possibly the best Dragon Ball film to date. Because Dragon Ball Super: Broly has the tall task of not only writing Broly into the current canon, but also fixing flaws with the character, the film doesn’t hit the ground running as immediately as the previous film, Dragon Ball Z: Resurrection ‘F’, was able to. A substantial chunk of the film’s length is dedicated retooling the origin stories of Vegeta, Goku, and Broly. The highlights of this section being the tweaks made to Broly and his father Paragus being exiled to the far reaches of space and a new look at the twilight hours of the Saiyan race told from the perspective of Goku’s parents Bardock and Gine as they rush to send their son off to the relative safety of Earth before Frieza wipes them all out. This initial part of the film can at times feel a little rushed as they jump through the history of the Saiyans, at times coming off a little like the greatest hits version of these events rather than the full fledged narrative. In particular I would have liked to have had more time with Goku’s mom Gine. However, because it is not exactly a hidden secret that they cut out a ludicrously substantive part of the film’s storyboards, likely to cut down the length of the movie, it is highly possibly much of the sacrificed material was from this part of the movie. The story the rest of the film focuses on takes place after the conclusion of the Tournament of Power arc from Dragon Ball Super and features a rather silly reason for the events to kick off that just has to be seen to be believed. While the overall plot in this film probably isn’t much to sneeze at, it greatly makes up for it in terms of the character writing. In general Dragon Ball Super: Broly has probably one of the smallest and most focused casts out of any Dragon Ball film to date, but nearly everyone is either well written or used to their best potential. Leading off we got the new changes made to the big man himself. The Broly in this film isn’t the same perpetual being of pure berserker fury always on the edge of slipping like his previous incarnation. This new Broly is a person far more deserving of the audience’s pity, as the movie goes to great lengths to paint the picture of a person who has had their life stolen from them by an abuser. Paragus is just the scum of the Earth in this movie, and his actions over the years has left Broly a broken person who is reduced to a puddle at the mere thought of his father activating the shock collar Broly wears around his neck. Even more tragic, like many victims of abuse in real life, Broly still deeply loves his abuser. It is actually his love for his father that helps trigger his ascension to Super Saiyan. Thankfully for Broly, he does manage to make some friends in this movie in the form of Cheelai and Lemo, two new members of the cast who are actually a pair of weak members from Frieza’s army who found Broly and Paragus in the first place. Both of them are wonderful additions to the franchise’s ever growing stable of characters, though Cheelai is the more standout one of the duo. In particular her reactions to seeing Broly be abused and the intense fire it lit inside her was great to see, and helped showed that even members of Frieza’s army could be good people. While Dragon Ball Super: Broly has some of the strongest character writing in a Dragon Ball film to date, even that doesn’t hold a candle to this movie’s true strength, its stellar visuals. There are action scenes throughout the entire film, but once Broly begins fighting Goku and Vegeta about halfway through the film, it is just a nigh non-stop barrage of fluid animation exuding a great sense of energy and force. There are multiple moments in this film that will make the inner child in any long time fan just absolutely giddy with what they are seeing. Unlike Resurrection ‘F’, Goku and Vegeta both get copious amounts of hits in, more than enough to placate the fans of either character. It isn’t just the fluidity of the animation that impresses, however. The choice of shot composition and camera flow is breathtaking in some sequences. One part of the fight with Broly that just vividly clings to my mind is where we get a long tracking shot where we are seeing the fight from Broly’s point of view, and it just left my mouth agape when I saw it. Unfortunately this movie does also incorporate some CGI into its visuals, and while for the most part it didn’t bother me at all, there are a few shots that are just so glaringly CG it can rattle some viewers. In addition, people who are sticklers about animated movies keeping on model might not be particularly forgiving of the animation, as to achieve the buttery smooth fluidity to the visuals, they did have to throw in every trick in the book in terms of intentionally going off model. 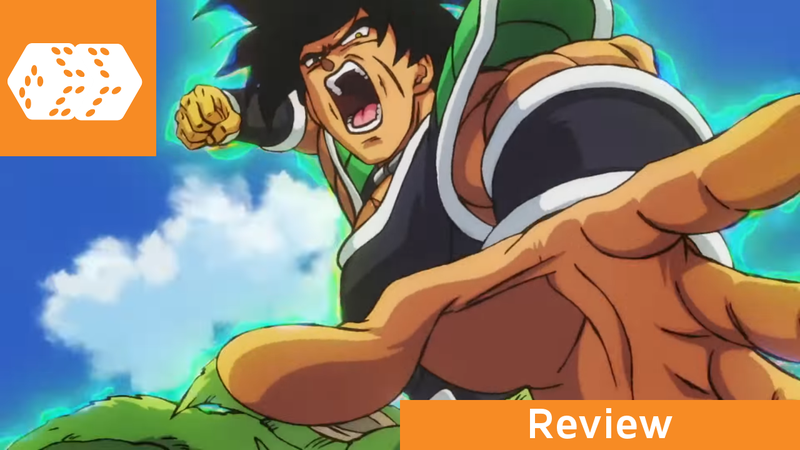 The Dragon Ball experience is not complete without some great music to back up what was playing out on screen, and Dragon Ball Super: Broly is no exception. Norihito Sumitomo continues to bring only his best when it comes to the musical composition for Dragon Ball works. There are numerous tracks on this film’s score that just match up to the visuals to an amazing degree. Some of my favorite songs from the movie include its main theme “Blizzard” by Daichi Miura and “Bardock Falls”. On top of the phenomenal music the English dub from FUNimation continues to be among some of the strongest in all of anime. Sean Schemmel and Chistopher Sabat excel as Goku and Vegeta like always, but great performances goes all the way down the cast list. There is some particularly impressive work out of Dameon Clarke as Paragus and Erica Lindbeck as Cheelai, as well as a simply awe-inspiring effort from Chris Ayres, who has been battling some really scary health issues recently, as Frieza. For any perceivable flaws I can even think to lobby at this film, such as a movie all about Saiyans not even mentioning Gohan despite Goten, Trunks, and Bulla being included on screen in some capacity, I can think of a strong counterargument. For the aforementioned example I can bring up how while it is true the film is about Saiyans, it is more specifically about the survivors of the destruction of Planet Vegeta. Even more personally to the characters, it is a film about a trio of sons having to deal with the reverberations of their fathers’ actions. That is not to say this is a perfect film by any means. Rather it just means that for anything the film potentially does wrong, what it does right more than overpowers it and leads to it being an enjoyable experience. Dragon Ball Super: Broly finally delivers a rendition of the Legendary Super Saiyan that is a complete package. He’s not just an awesome tower of meat and might, he now has a compelling, emotional character to go with it. I actively want to cheer for Broly now. For anyone who has grown up watching the series, this is the franchise at its current cinematic peak, and is an experience no fan should miss. Dragon Ball Super: Broly is based on the Dragon Ball franchise by Akira Toriyama. It has been licensed by FUNimation and is currently airing in theaters on a limited release. You can find a location screening the movie here.